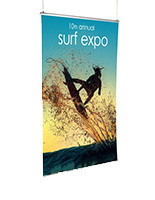 Poster hangers are perfect for hanging and displaying printed graphics. 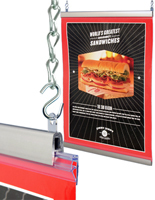 Consisting of a top and bottom rail, these displays are simplicity defined. 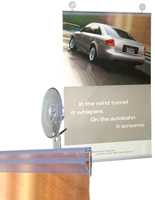 Our poster hangers, also called poster or banner rails, are wholesale priced marketing tools needed by every retailer. Their main application is for hanging against the inside of storefront windows. 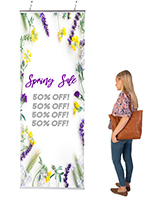 Retailers and clothiers especially use poster hangers to promote seasonal sales in their shopfronts, while fast food establishments like to announce the newest frozen drink or food special. 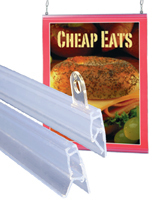 Unlike traditional poster framing, these hanging rails are cheaper and easier to mount. 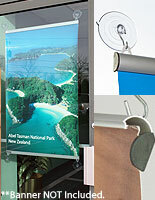 And since they can be ceiling mounted, poster rails offer many more display options than standard wall mounting. Multiple graphics can overlap each other, creating greater visual impact, especially inside custom-designed window displays. 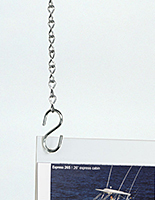 What sizes do these poster hangers come in? How are poster rails displayed? 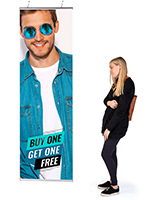 These poster hangers are initally designed to be suspended right behind the front window of a store. Passersby (and driversby) will be able to notice your ads well before they even step foot into your establishment. 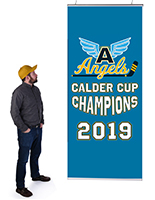 When combined with one of our hanging hardware kits, these sign displays can be suspended from the ceiling throughout your store. 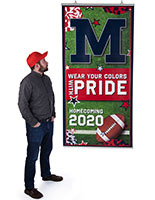 Hang advertising graphics above aisles or in hard to reach areas for grabbing customer attention. 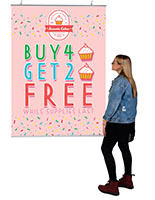 This is a great way to free up wall space for shelves or display cases while still allowing you to target customers with the current promotions. If you choose to utilize suction cups as your hanging method, the rails could also be suspended from the inside of a window to attract the attention of people outside. This method removes the need for any kind of mounting hardware whatsoever. 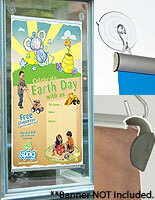 With the hanging options listed above, you also have the benefit of creating a double sided display. 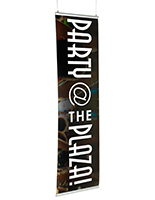 Since the banner rails can support thicknesses of up to 1/16", you could place two posters or vinyl banners back to back in the holder. This way you'll be able to get customer attention coming and going, or inside and outside your store (in the case of a window display) all at the same time. It's a given that this sign making equipment is great for use in stores. 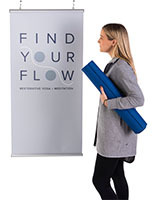 With these marketing tools, stores can get their advertising and other promotional images out to customers while saving a great deal of money. We sell many models for well under $10, and since they are so cheap, we recommend buying multiple numbers in bulk to create an advertising scheme throughout your entire store without depleting your company budget.